If you can't decide where to begin, you may want to start with one of our pre-assembled PERLAVITA bracelets. 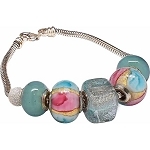 Each bracelet is loaded with Murano glass and sterling charms and arrives to you completely assembled in a leather bracelet box. If you wish to add more charms later, simply unscrew the endcap and slide your new charms on.